What you are seeing above is not a figment of your imagination. It is, in fact, a new app made by Zhephree that is coming to TouchPads everywhere very soon. As was the case with incredible!, neato! and Foursquare updates of years past, we're kind of excited to see another project come from this signature webOS app developer. 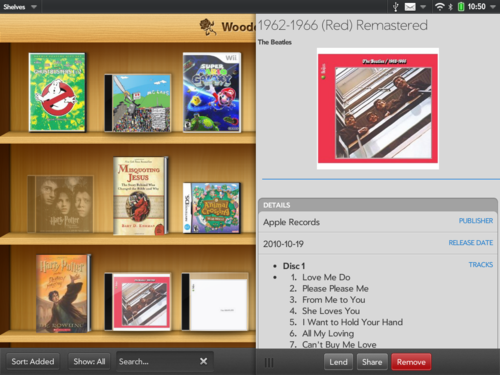 Wooden Rows (the name of the new app), will give TouchPad owners the ability to keep track of all of their books, CDs, video games and movies, and even "lend" those prized possesions out to friends or family (as long as they are a contact already synced to your device). You can also share the items individually across Google+, Twitter or Facebook with a link to what Zhephree describes as "much like that of Instagram". The app looks neat and will be very useful for those of you who actually still own CD's and the like, but what really gets us excited is the concurrent unveiling of another new Zhephree project; dubbed, Zhephree Accounts. Zhephree Accounts are a new creation that will surely enhance the experience with his apps to become better than they already are. In a similar fashion as Villo.net, Zhephree Accounts will allow users of neato!, incredible!, Foursquare, Wooden Rows and whatever other apps he is cooking up to sync across devices and platforms via a single user login. You will be able to save your spot in Incredible! for the TouchPad and your smartphone or sync your Wooden Rows library with your desktop computer and mobile device for browsing while on the go. App data will all be stored in the cloud via Zhephree.com, and everyone will have access to their own data (and to revoking app-access to that data - privacy concerns be gone) via a user-portal. We like cloud services just as much as any of you (we've talked about Villo extensively in the past), and it's nice to see a webOS developer continue their work with the platform, even after all of the other shenanigans that HP is putting us through right now. Wooden Rows is said to be 95% done right now, so we should expect it soon. Be on the lookout for it landing in your App Catalogs as soon as Zhephree is finished, and let's hope those Zhephree Accounts come soon after.